A successful football team is one where the players and coaches work together to achieve their goals. While the bulk of the attention is given to those players and coaches there are plenty of other people who make a football team go every day of the season and the offseason. One group of people that might just be the most important is the football moms. Whether it’s making meals that keep the player strong, doing that dirty laundry or giving the support that helps the player stay focused the football mom is in the silent force behind a successful football program. Powerade wants to honor these unsung heroes with the Powerade Mom of the Week contest presented by Heartland Coca-Cola. 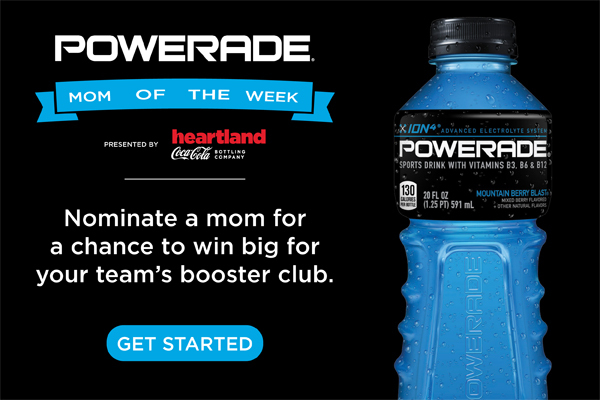 Each week you can nominate a mother for the Powerade Mom of the Week presented by Heartland Coca-Cola by submitting an essay telling us why your mom’s impact is important to your individual or team success. Each week the winning essay will earn that team’s booster club a $500 courtesy of Powerade and Heartland Coca-Cola. This week’s Mom of the Week is Julie Zitlow from DeSoto. Zitlow was nominated by two different people. Below is the nominating essay submitted by Wildcats’ assistant coach Mark Gastelum. “The DeSoto Wildcat football program would like to nominate Julie Zitlow for the PrepsKC Mom of the Week award. Julie has been an active member of the DHS Pep club, helped design and organize spirit wear, donated vehicles for the football team to ride on during our DeSoto Days and Homecoming parades, and helps provide our game day meal for our entire team.